Glenmoriston Pipe Band, Suffolks Pipes and Drums. 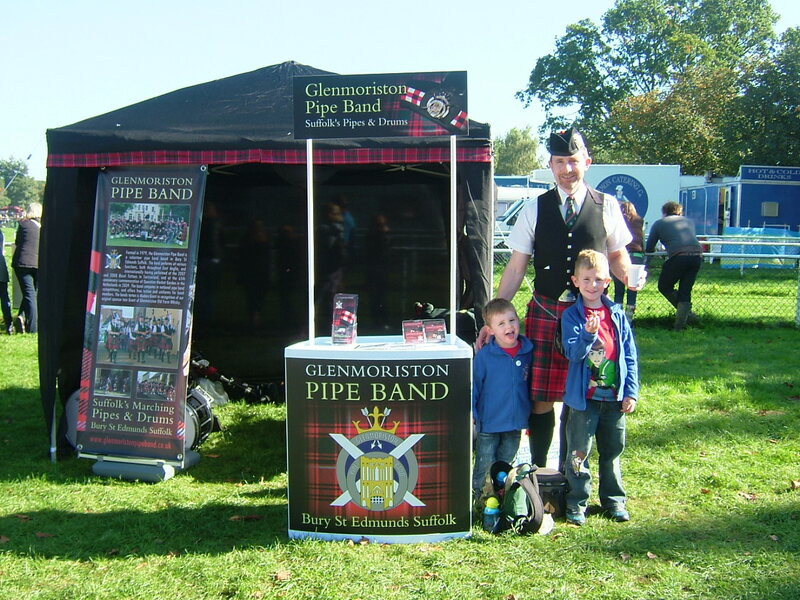 Formed in 1979, the Glenmoriston Pipe Band is a volunteer pipe band based in Bury St Edmunds Suffolk. The band performs at various functions both throughout East Anglia and internationally having been represented at the Basel Tattoo in Switzerland, Operation Market Garden commemorations in the Netherlands and Fulda Tattoo in Germany in recent years. The band competes in national pipe band competitions and over the past year has had a busy time building to a standard to which we are in the position to compete in many more competitions locally and far afield such as Scotland. The band offers free tuition and uniforms for band members. The band’s tartan is Modern Grant after the band’s original sponsor Iain Grant of Glenmoriston Old Farm Whisky. For more information about the band please contact the Pipe Major, Stephen Jones via email on gpbpipey@hotmail.com or telephone 01284 728790. New members required! The band membership is healthy but the band is looking to grow its numbers, so if you are a piper or a drummer, or would like to learn then why not come along and meet us at one of our practices. There is no limit to the number of players we can have. If you are interested in joining the band or even supporting the band as a non playing member then please get in touch. Where else can you get FREE music lessons? Steve Jones (and “assistants”) pictured with the band marquee and information point whilst the rest of the band go scouting for the refreshment tent………. The band membership is healthy but the band is looking to grow its numbers, so if you are a piper or a drummer, or would like to learn then why not come along and meet us at one of our practices. There is no limit to the number of players we can have. If you are interested in joining the band or even supporting the band as a non playing member then please get in touch by emailing Stephen Jones on gpbpipey@hotmail.com or telephoning 01284 728790. The band’s next performance will be at a launch event on the 2nd February at RAF Mildenhall followed by busking in Bury St Edmunds on the 18th May. In between this, we plan to participate in branch competitions of the Royal Scottish Pipe Band Association and have an open air practice in Bury St Edmunds – details to follow – do come and talk to us! If you are looking to add a special dimension to your event please contact us to see if we can help.